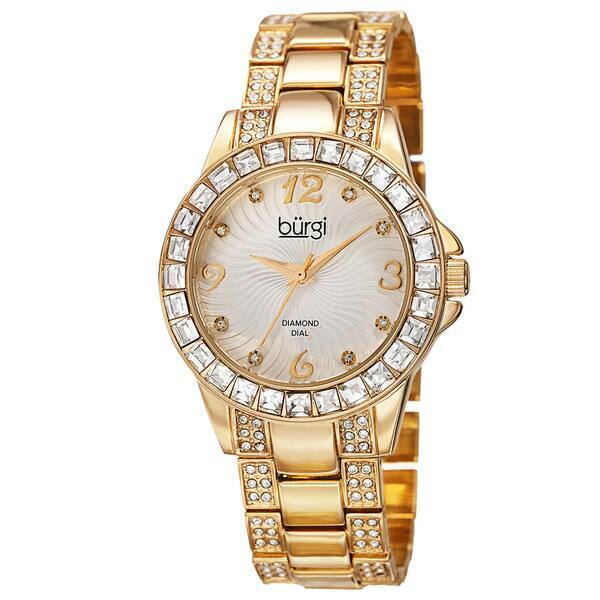 This Burgi women's watch features a row of baguette crystals on the bezel and genuine diamond markers. The embossed pattern dial and studded bracelet create a sparkling timepiece. It is definitely a dazzling eye-catcher that is great for any occasion. I purchased this watch in the two tone gold-silver. You cannot go wrong with either style with this watch, whether it is the gold or the two-toned. It is just plain gorgeous. I bought this watch for my mom for her birthday and we absolutely loved it! She have always wanted a watch with some diamonds and this definitely did the job. I liked the watch and so did the woman I gave it to. The only problem was that my original purchase was lost and required a lot of action to get another sent. It was supposed to be a Christmas present, and it was almost Valentine's Day by the time the replacement came. Also I was unhappy with the fact that the original was two-tone gold and silver, and they claimed to be out of those and I had to take a silver one. The next week, the watch I had originally wanted was advertised at the same price I paid. Also, the original was to come with a bangle crystal bracelet and the watch she got did not come with it. I was very disappointed in the whole process to the point that if I wanted to get my girlfriend an engagement ring, I would get one elsewhere. I bought this watch for my wife, she hasn't worn it yet. She has to get the band size. But from the look of it, it a nice watch. My Wife loves it ! Nice size,easy to read,use,and wear. I love this brand. I purchased the silver tone version of this item, and truly love theCrystal accents on the band. It isn’t often that the band gets much attention. It certainly did with this watch band. Not much I don’t like. Would recommend! It is not only a beautiful watch, it keeps great time! Very nice watches, even the free "gift" watch. My wife loved them! no problems at all and came in a very nice box. Beautiful time piece. A perfect gift for someone you cherish. Beautiful ladies watch but I was looking for something a little larger face the bigger watches are what is it style now and look very good on every one wish it had of been larger Iwould love to have kept it. The gold was a very rich color a expensive looking. Very lovey watch. Just the right size--not too small or too large. Watch is very pretty, but I cannot seem to size it appropriately to my wrist and it floats around too much. Followed utube video on sizing, but cannot get the pin out. Will have to take to a jeweler. happy with quality for the price. Absolutely stunning, and definitely suitable for special occasions. My cousin loved her birthday present. She said, it was beautiful and very elegant. The quality is extraordinary and the stones are very vibrant. "How do I order the Silver version of this watch Or gold the only option"
The silver-tone option is currently in stock.